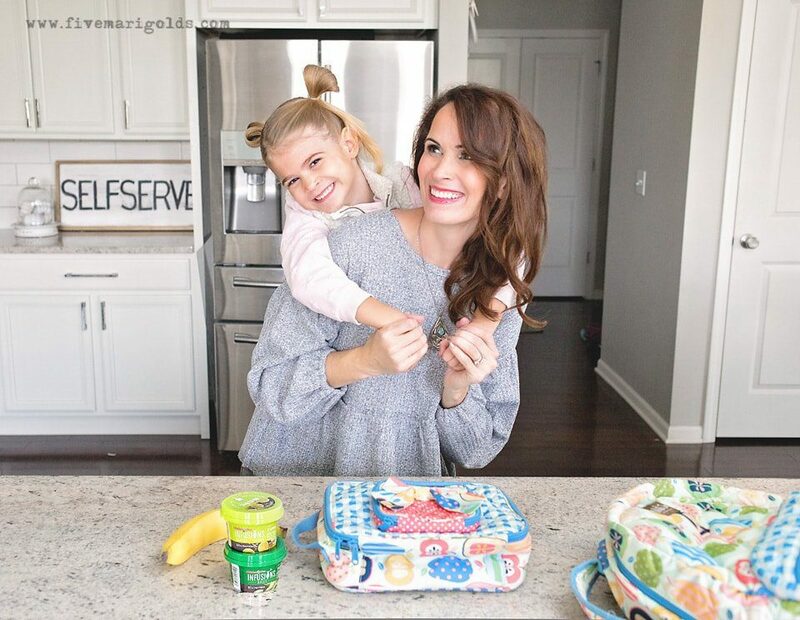 A big thank you to Chicken of the Sea for partnering with me on this post about my daily routine as a work from home mom. All opinions are my own. Earlier this year I posted about all the ways I make a full-time income from home, and ever since then I’ve gotten a lot of questions about how I make it all work. As it turns out, there are many of you who feel the same way I do about wanting to do it all – work from home while being more present for family. Today I’m sharing my daily routine as a work from home mom – which, as you’ll read, changes every single day. 4:00 a.m.: Alarm goes off. Nope – not a typo! I get dressed, make myself look (somewhat) presentable, grab a quick cup of coffee and head to my office to prepare for the first appointment of the day. 4:30 a.m.: Begin my morning side hustle: teaching ESL classes online. I love this work because it it’s fun and stress-free, and gives me the consistency I don’t always have with freelancing and blogging. 7:30 a.m.: Help my kids with the last of their morning routines, like brushing hair, signing forms, and packing lunches. Somehow, waking up extra early helps me to be more patient and present during this morning routine. I think that being fully awake and caffeinated has a lot to do with it! 7:50 a.m.: Walk the kids to the bus stop. 8:20 a.m.: Throw a load of laundry into the wash and freshen up. 8:30 a.m.: This part of the day varies according to my current workload. If I’m freelancing, I may begin my commute to a client meeting. More often than not, however, I’ll begin my day working from home – whether it’s for the blog or for freelance work. Despite having a perfectly good desk, I prefer to work from the couch. 11:30 a.m.: Break for lunch. Whether I’m working from home or on the road, lunch is something I’ve struggled with. I hate making a lot of effort to prepare a meal for just myself, but not planning ahead leads to unhealthy choices. Lately I discovered the perfect solution, no matter where I’m working – Chicken of the Sea Infusions. 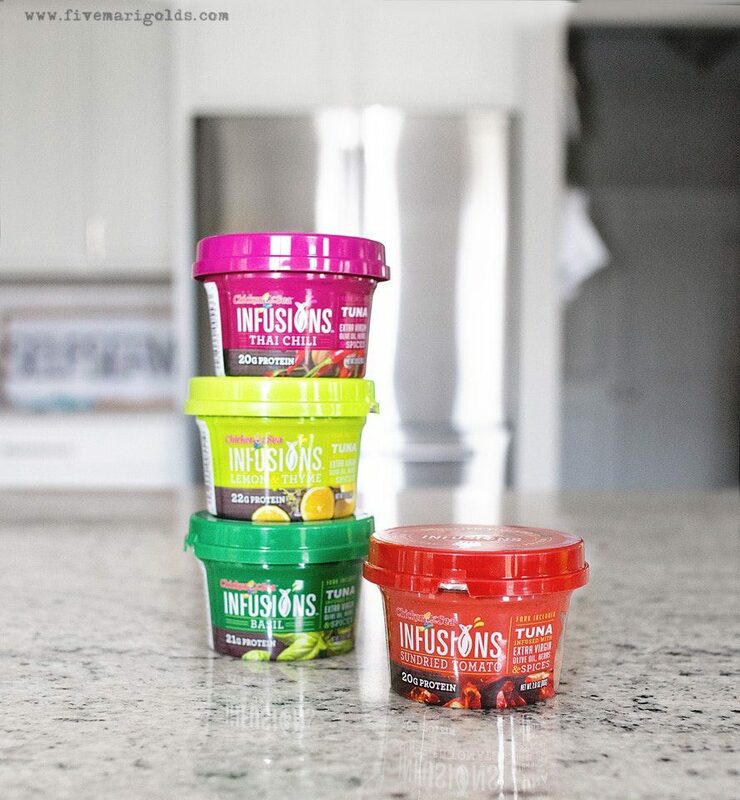 Infusions uses high-quality tuna infused with just the right amount of extra virgin olive oil, herbs and spices in four flavors: Lemon & Thyme, Sundried Tomato, Thai Chili, and Basil. 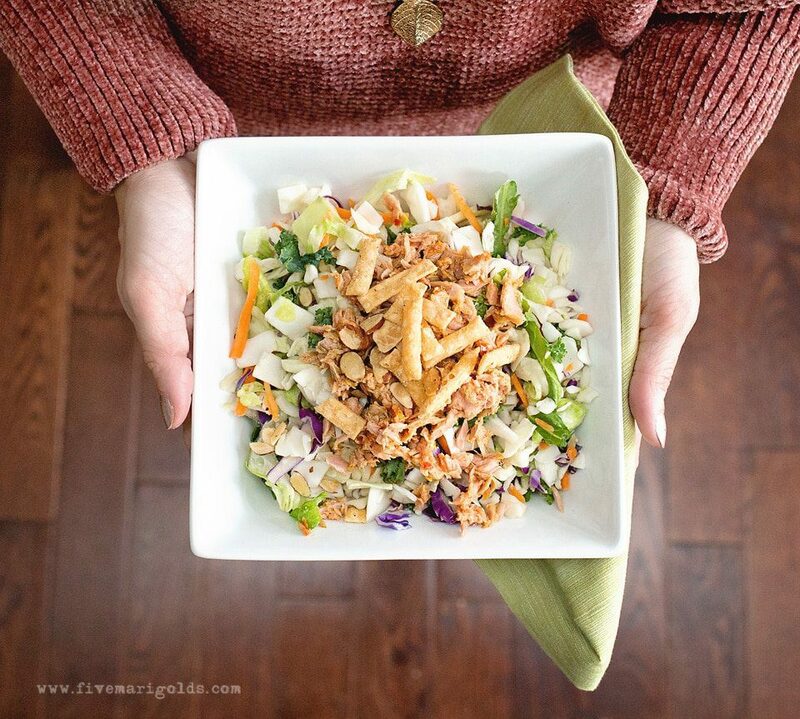 I absolutely love the Thai Chili flavor over a salad and topped with wonton crackers. 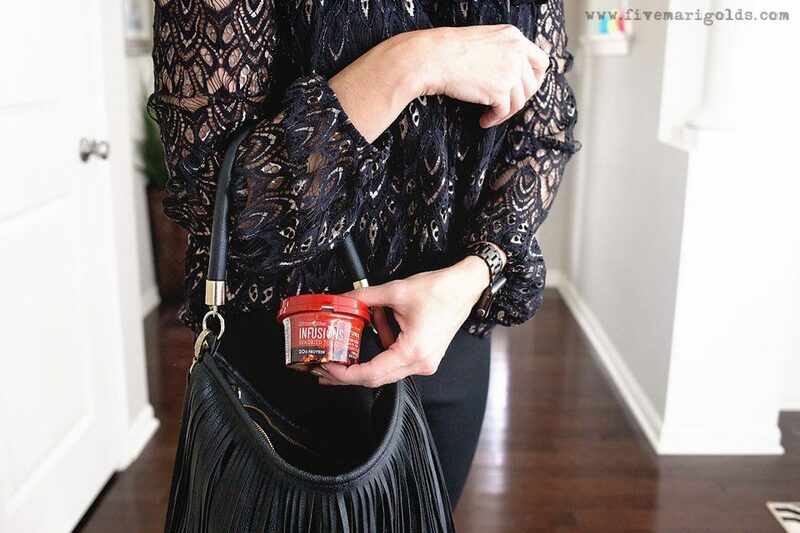 Or, if I’m on-the-go, I can just pop another favorite – the Sundried Tomato flavor – into my work bag to eat right out of the container – it has a resealable lid and even comes with a built-in fork. Plus, it’s packed with 20 grams of protein so I’ll stay full all afternoon. 12:00 p.m.: I’m filled up and ready to put in a solid afternoon of writing, client calls and photography. If I’m working from home, I’m also fulfilling any orders that came through my etsy site or Ebay for the second-hand clothing and used vintage goodies I’ve sold. 2:30 p.m.: Realize I forgot about the load of laundry I started in the morning and decide whether I’m going to actually fold it, or hold off for another another day (or four). I usually choose the latter. 3:45 p.m.: Prepare an after school snack, help with homework and talk about our day. 4:30 p.m.: Finish up any work for the day before wrapping up to prepare dinner. 5:30 p.m.: Prepare dinner. I try to plan out a month worth of recipes on our meal plan every month! This helps save on groceries and avoids any impulse to eat out or grab unhealthy convenience foods. I’d love to say my work ends at this time, but the truth is, I enjoy what I do enough to check back in here and there throughout the evening. 6:30 p.m.: The kids help clear the table and do their chores (dishes and garbage). 7:00 p.m.: Bath time, prepare school bags and charge school-issued laptops. 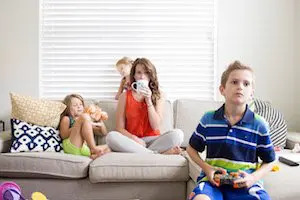 Juggling three jobs from home, motherhood, and the household definitely has its challenges. So, how do I make it all work? You may have noticed I didn’t document my bedtime here, because it is ridiculously early and varies. Sure, I do wake up ridiculously early as well, but the truth is, I’ve always preferred to hit the sack early. Trying to push myself to do otherwise usually has unpleasant health consequences for me, so I’ve learned to trust my body on this and go to bed when I need to. Earlier I mentioned how I plan out a month worth of meals at a time, but the truth is, having a game plan for one week at a time can make a world of difference – not only in our routine, but in our eating habits. In addition to planning out our family dinners, I also plan the kids’ lunches a week at a time. When I’m really firing on all cylinders, I’ll have the kids help me prepare their meals the night before. Crackers, veggies, fruit, cheese and Infusions, and lunches are done! 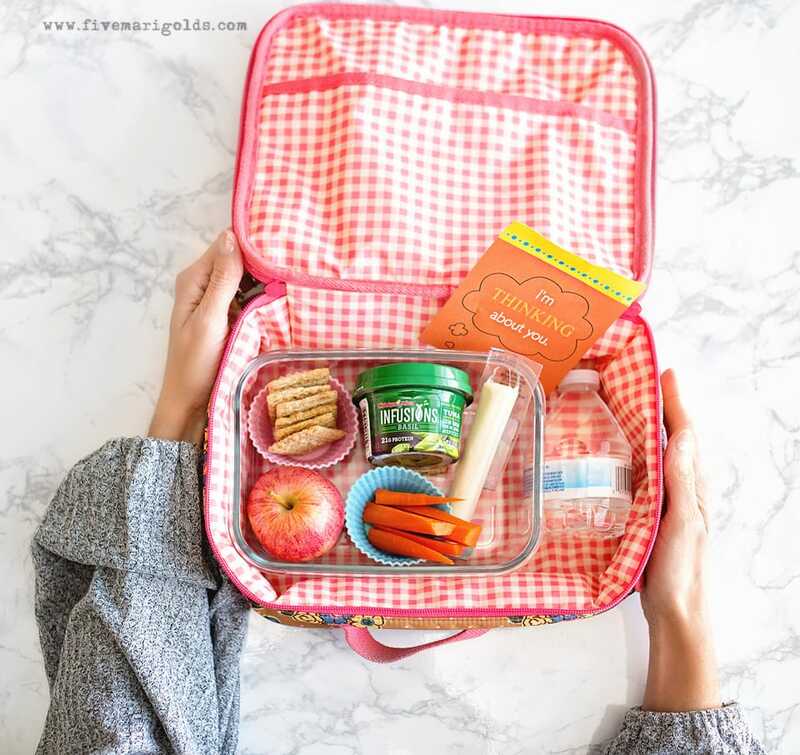 And, because the lids are resealable, we are often able to make a container last for two lunches, making it both a healthy and super budget-friendly lunch. So, what do you think of my daily routine as a work from home mom? Does it sound amazing, or kind of crazy?! I’d love to hear your thoughts and answer any of your questions in the comments below. Or, why don’t we talk in person?! I’ll be at the Meijer in Elgin, Illinois on December 1, 2018, to check out the free Chicken of the Sea Infusions tasting event. Free sampling will last from 11 a.m.-1p.m. In the meantime, be sure to check out Chicken of the Sea Infusions online.